* One yearly flat fee and we come out each time there is an 1" or more of snowfall. Regardless how often it occurs. 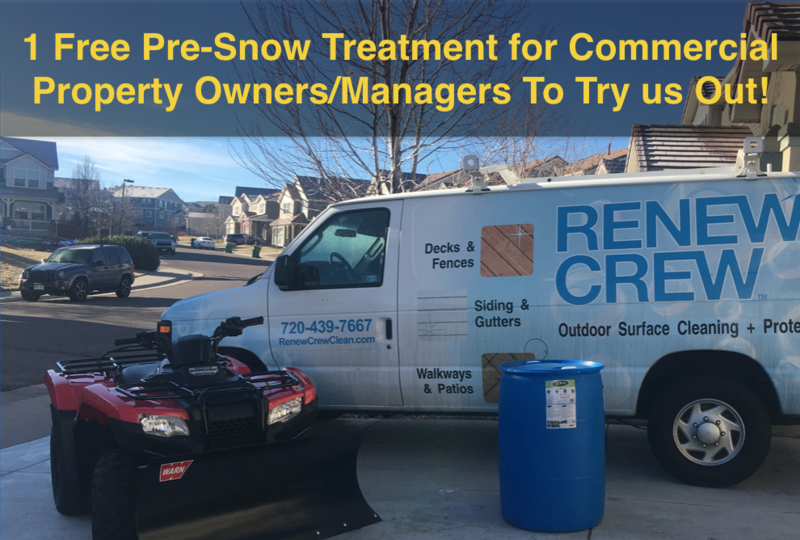 If you need a hand with snow removal and de-icing for your store, housing community or business, Renew Crew at Castle Rock can help. Don’t lose customers because of a parking lot full of ice and snow. Instead, let us clear your sidewalks, parking areas and entranceways so you can get on with business. 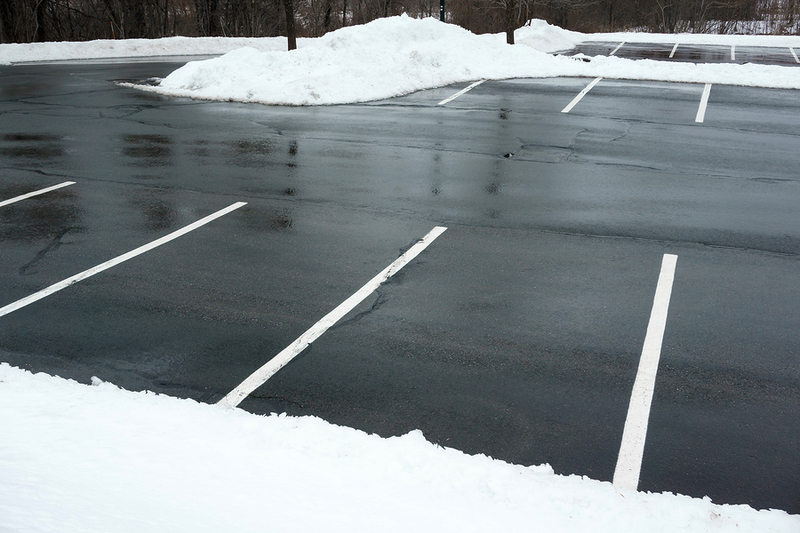 We use Liquid Snow Shovel, a premium anti-ice and de-icing solution, that works as fast as we do to get rid of the snow and ice, so your customers, homeowners and employees can park hassle-free. The product is more enduring than salt and keeps your driveways and parking spaces clear longer. Our de-icing product is clean, clear and odorless so you barely know it’s there, and the non-staining product leaves no ugly white residue behind once the snow and ice melt. Its biodegradable formula is safe for the environment, and the liquid is non-hazardous to you and your pets. Liquid Snow Shovel absorbs into the pores of the concrete, so it’s much more effective than salt, which sits on top of surfaces. The barrier will melt snow/ice down to -25 degrees. When a snow event arrives, Liquid Snow Shovel will melt the first 1/8" – 1/4" of snow while the rest will accumulate on top, forming an “igloo,” to keep it from refreezing. This wet layer is what keeps the surface safe and the reason why removing the snow down to bare concrete is as easy as pushing it away! Shoveling and Plowing will not remove the barrier. It’s also 70 percent safer than ordinary rock salt so we can clear the snow without damaging your parking area and sidewalks. For optimal results, we apply,weekly, before the snow events arrive, and the resulting protective layer keeps it all from sticking. When the snow is shoveled away, there’s no leftover slick ice that can cause slips and falls. Renew Crew at Castle Rock also takes care of snow removal after a big storm. However, keep in mind that the best preventive is to apply regular treatments of the de-icing product during the months of November to April. We can come to your housing complex, restaurant or storefront once a week, or apply a one-time treatment for a snow-free zone where you need it the most. Call today to schedule your winter snow removal plan.